﻿Mindteck Academy’s live, instructor-led Hadoop, Spark and Scala online course prepares experienced and rookie professionals for in-demand roles at data-driven enterprises around the globe. In this structured program, curated and taught by an industry expert, you will learn about Big Data and the Hadoop Ecosystem. The first half of the course begins with an introduction to Big Data concepts and its application in the real world. 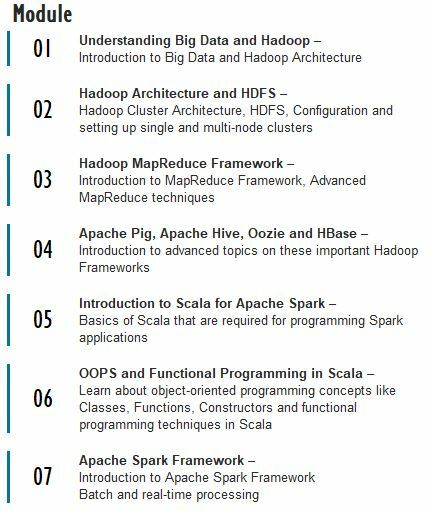 Then the lectures move on to advanced topics, such as the Hadoop Distributed File System, batch/parallel processing using MapReduce, and various frameworks defined in the Hadoop Ecosystem (i.e. YARN, HBase, Pig, Hive, Oozie and Zookeeper). 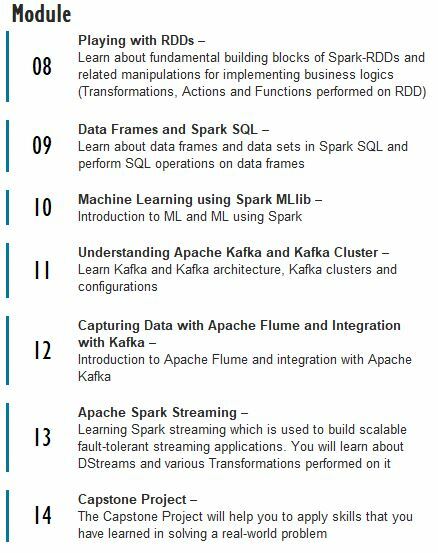 In the second half of the course, you will learn Apache Spark and Scala in detail. Apache Spark is a fast general processing engine compatible with Hadoop data. It is designed to perform both batch processing and new workloads like streaming, interactive queries, and machine learning. Scala combines object-oriented and functional programming in one concise, high-level language. it is used to work with Spark. The course ends with a Capstone Project which will help you apply skills that you've learned in solving a real-world problem. The market for Big Data analytics is growing across the world, and this strong growth pattern translates into a great opportunity for all IT professionals – seasoned and new – to accelerate their careers. Click HERE to view FAQs, sample use cases and more! Starts Monday, February 8th promptly at 8PM ET with Orientation, continuing on with the initial lecture until 10PM. The remainder of the live, instructor-led online course occurs 4 days each week - Monday, Tuesday, Thursday and Friday. Starts Saturday, TBD promptly at 9AM ET with Orientation, continuing on with the initial lecture until 2PM. The remainder of the live, instructor-led online course occurs every Saturday and Sunday. There are no prerequisites for this course. Prior knowledge of Core Java and SQL will be helpful, though it is not mandatory. There will be case study driven sessions and extensive hands-on coding. To brush up your skills, our training partner provides a complimentary, self-paced Java Essentials for Hadoop course when you enroll in this course. You will use your own computer and be expected to have a Windows 7/10, Linux or Mac system. You will be utilizing CloudLab, a Hadoop environment accessible via a browser with minimal configuration. An up-to-date browser on your system is necessary.